This Majestic Squire Ballpoint Pen has a Swarovski Crystal in it's clip. Looking for a high end pen? You have found one here! This stylish handmade pen would make a great executive gift, "thinking of you" gift or a gift for a new job. The acrylic ink pen that is pictured is the fancy pen that the buyer will receive. 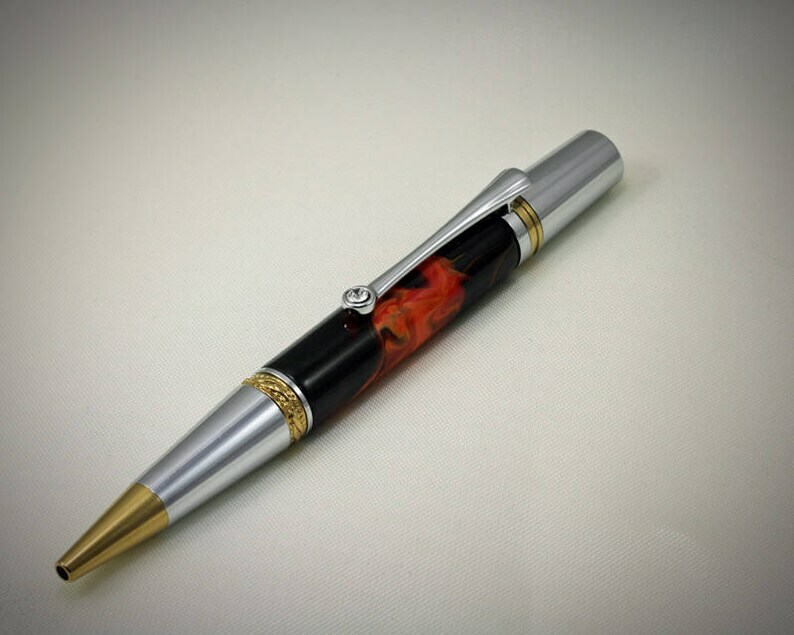 Pen component plating: This is a chrome pen with titanium gold accents. Packaging: This pen comes packaged in an Ohio Penworks pen box. Ohio Penworks purchased the blank for this pen from a 3rd party. I cut it to size, drilled the appropriate diameter hole dead center down the length of the blank and glued a brass tube into the hole. Then I squared the ends of the blank down flush with the ends of the tube. Once all the blank preparation was completed I mounted the pen blank on a wood lathe. Using hand tools, I turned the blank down to it's final shape making certain that the ends of the blank were just the right size to match up to the components of the plastic pen . When that was accomplished I sand, polish and buff the blank to a high shine. Lastly I attached the components to the blank using a special press and a drop of adhesive. Ohio Penworks wants to earn your trust and keep you as a customer for years to come. If a pen purchased from Ohio Penworks does not meet your expectations you may return it within two weeks of receipt at no cost to you. Simply email Mike [!at] OhioPenworks.com or call 614-259-PENS (7367) within 7 days of receipt to receive return instructions. When Ohio Penworks receives the item the entire purchase price and cost of return shipping will be refunded to you. Beyond the two week period described above, Ohio Penworks pens are warrantied for two years from date of purchase, excluding damage caused by abuse, neglect or normal wear and tear. Thank you for visiting Ohio Penworks. Attractive and well balanced segmented pen. Thank you! This pen is gorgeous, and exactly what I expected. What a great piece, excellent craftsmanship!